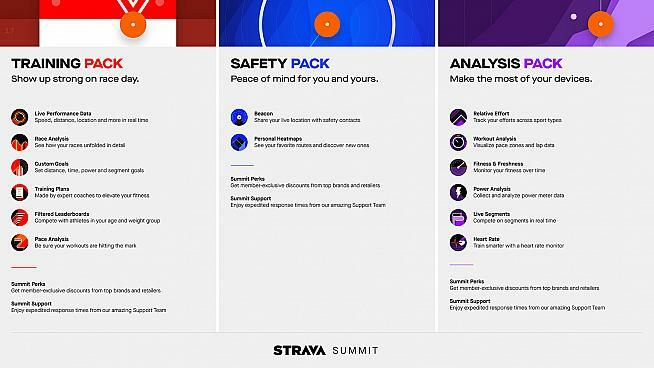 Strava has renamed its premium offering and split it into use-targeted components, which can be bought separately or bundled together. Pricing stays the same for the whole lot at $59 per year or $7.99 a month. Each pack is $2.99 monthly or $23.99 annually. The three options are Training, Safety and Analysis. All offer Premium Perks, a package of discounts on purchases and services from the likes of New Balance, Competitive Cyclist, Peppermint and Science in Sport, and faster customer service through Premium Support. Safety's main feature is Beacon safety tracking, which allows friends and family to see where you are in real time. There are also activity heatmaps. Training claims to offer everything you need to train better and achieve your targets, including training plans and personalized goals. Analysis is designed to exploit the information produced by your cycling gadgets with power analysis and tracking of fitness and freshness among other things. The T-shirt emblazoned with the words "If I crash pause my Strava" I spotted at Alpe d'Huez in July is a good indication of how engrained the Strava app is in the cycling world. For all the growth Strava is not turning a profit and the Summit change is aimed at convincing those exploiting the free part of Freemium to pony up for some premium features for about the price of a latte a month. The good news is that the "Free" section of the model remains as it is and current Premium users will pay no more for Summit. 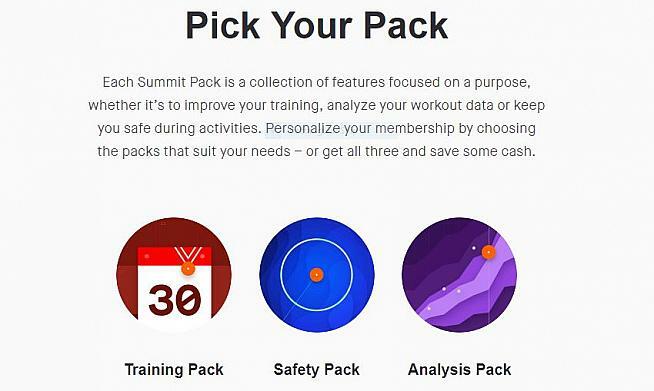 Each Summit Pack is a collection of features focused on a purpose, whether it's to improve your training, analyze your workout data or keep you safe during activities. Personalize your membership by choosing the packs that suit your needs - or get all three and save some cash. All the tools and insights you need to reach your goal and train smarter. Whether you've got an upcoming race or are trying to get in better shape, this package is for you. Stay motivated with personal time, distance, power and segment goals. Get plans from the best coaches in the business. Detailed post-race breakdowns of your performance. Level the playing field when you filter leaderboards by age or weight. Relive your efforts and see how the race was won. Explore new roads and trails, all with peace of mind from Beacon. 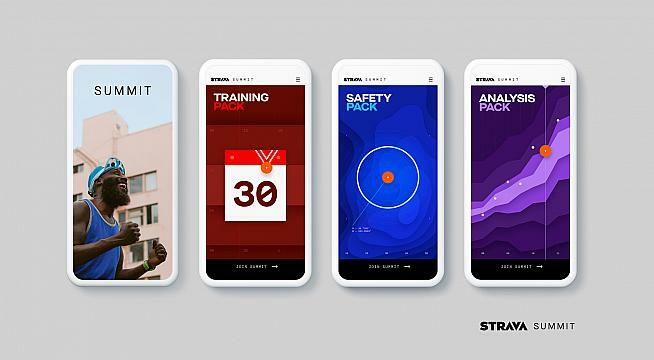 Share your real-time location with safety contacts and see where you've been with Beacon safety tracking and exclusive heatmaps. Give friends and family peace of mind with private access to your live location during activities. Generate unique visualizations of all the places you've been active. Get more insight from your dedicated GPS device, heart rate monitor or power meter. Get the most value from your connected devices with features that help you decode your data. Track your intensity across sport types, see your fitness trend and stay consistent with your training. Track your fitness over time and understand the impact of your training. Visualize your pace zones and lap data for all your run workouts. Compete against your best efforts or others' in real time.